The content-first campaign is designed to educate these high-level executives about the suite of technology products F5 offers, looking to drive demand from the top down. Previous efforts have been targeted at technical audiences, such as network architects. 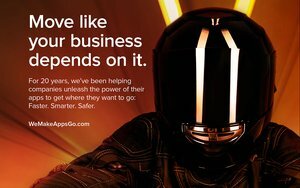 The campaign, developed by Seattle agency POP, carries the theme: “We Make Apps Go: Faster. Smarter. Safer.” It will include paid online media and content marketing across major business publishers and networks, as well as print and out-of-home advertising at events such as RSA 2017, an information security event. The work drives consumers to a dedicated Web site, “www.WeMakeAppsGo.com,” where they can find content — including articles, videos, infographics, and podcasts — about how the company’s products work. The content is light on hard-sell, intending to educate rather than preach.